When I wrote the aforementioned critique, I had barely seen 10% of the game. Now that I have come within about an hour’s playing time of finishing the game (or one of the game’s endings, anyway), I feel I can make a more qualified evaluation. This game is much better than I originally thought. It still feels like a more “trimmed-down” experience than the original Deus Ex, particularly in the size of the levels, but I’ve been quite satisfied with the story so far. Seattle (the first location) was very boring compared to everything that comes after it, and now that I’m at the end, I’ve experienced some truly memorable gaming moments—something I did not expect to see at all during my travels in DXIW. My initial impressions of Invisible War (hereinafter referred to as DXIW) were mixed. On the one hand, it was great to be playing a sequel to 2000’s Game of the Year, and the storyline seemed engrossing. On the other, the game was obviously dumbed down in favor of the Xbox players out there—levels were tiny, advanced options like skill points had been removed altogether, and the performance was horrible. But now that I’ve gotten almost to the end, I’m having second thoughts about my earlier banal reaction to the game. Not because any of the above things has changed—but because the good things about DXIW have grown proportionally the longer I’ve played, until they further overshadow the faults. One thing I noticed about DXIW was that it shared a certain air with what is quite possibly my favorite game of all time, System Shock 2. Nowhere is this more apparent than in Antarctica. The journal entries left behind by the VersaLife scientists as they struggled to survive after the Collapse…the V-mails recorded twenty years ago, telling of “something having gone wrong with the world…” It was all very spooky, and done extremely well. Then, when the player enters the sanctuary of JC Denton and experiences pockets of architecture created from the memories of JC himself (Maggie Chow’s apartment, Manderley’s office, et. al. )—pure golden gaming entertainment, and very much like the climactic end of System Shock 2, wherein the player revisits SHODAN’s birthplace of Citadel Station and finds it exactly as it appeared in the first game. In DXIW, when you’re reliving those environments from the previous game, snippets of the original music from the level they represented can be heard echoing in the distant background of the soundtrack. Just as you try to listen closer to them, they fade away. I loved this. The original DX soundtrack has always been one of my favorites. I also love tie-ins, and the end of DXIW has lots of tie-ins with Deus Ex. For example, when you walk into the ruins of the UNATCO building and find a couple of hobos downstairs in the staff lounge (the place where Gunther Hermann once bitched about the pop machine giving him lemon-lime when he asked for orange). The hobos are musing about the pop machine, which they have broken open only to find it contains nothing but lemon-lime soda! “Was it some kind of conspiracy?” one of the hobos wonders aloud. And in Maggie Chow’s apartment, the books on her shelf are some of the same tomes you find in her apartment in the original game—specifically, the books that lead you to discover her new computer login. Moving right along, I’d like to comment on the story. It seems very well done. It’s not as deep as the story in the original DX, nor as awe-inspiring, but it is better than most game storylines seen today. There are numerous plot twists and the ubiquitous “choose your own adventure” decision fork at the end of the game that allows you see different endings. I haven’t completed the game yet, but I can tell you that for my first ending I am going to do the Dentons’ bidding. It only seems right, somehow, after actually playing as JC Denton in the first game. So, in short, I am revising my earlier opinion of Deus Ex: Invisible War. It’s really a very good game. It has problems, more so than the original DX, but it’s still very worth your time. Especially if you enjoyed the first game’s story and want to find out where it goes next. 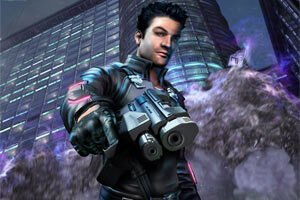 Speaking of “next,” I hear Ion Storm is already talking about Deus Ex 3. Here’s hoping they shun the console crowd entirely and make it a pure-PC follow-up, something that will do the first game justice.